From left: Aly Jiwani, Area general manager, OpenRoad Auto Group; Curtis MacDonald, brand manager, Karma Vancouver; Christian Chia, president & CEO OpenRoad Auto Group. OpenRoad Auto Group has launched Western Canada’s first Karma Automotive dealership with the opening of Karma Vancouver, located at 1717 West 5th Avenue on Vancouver’s west side. 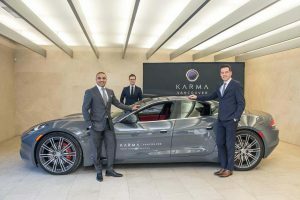 Karma is a Southern California-based automotive manufacturer known for its luxury electric plug-in hybrid sports cars and has partnered with a select number of North American automotive retailers to represent its brand. OpenRoad Auto Group is one of 12 Karma dealerships in North America, and just one of three in all of Canada. Founded in 2014, the Southern Californian auto manufacturer has earned a reputation for delivering a combination of advanced technology and timeless design with the new Karma Revero, an ultra-luxury electric plug-in hybrid Grand Tourer sedan. Karma Revero is the first electric extended range vehicle sold in North America that is powered by the sun through its solar panel roof. Employing a series hybrid engine, the Revero’s lithium-ion battery powers its electric motors to turn the rear wheels—giving up to 80 kilometres of pure electric driving range. The inspiration behind the Karma logo was an eclipse, showing a spark of sun, the eternal symbol of endless renewable energy. Each Karma is unique, with individually hand-painted emblems of the company’s logo on the front and rear of every vehicle. The inspiration behind the Karma logo was an eclipse, showing a spark of sun, the eternal symbol of endless renewable energy. The 2018 Karma Revero will be on display at the 2018 Vancouver International Auto Show March 28th to April 1st. For more information, visit www.karmavancouver.com.